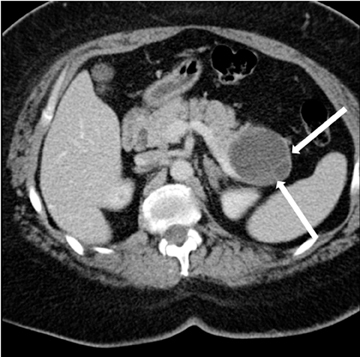 In Part 2 of this two-part article, the authors discuss imaging manifestations of various abnormalities affecting the pancreas. Diagnosis of pancreatic conditions is a challenge to physicians due to the anatomical location of the organ deep within the abdomen. Imaging with multidetector computed tomography (MDCT) and magnetic resonance imaging (MRI) along with the use of 3-dimensional(3D) imaging play a critical role in the evaluation of pancreatic diseases. This rare form occurs in the spaces between the head of the pancreas, the second portion of the duodenum, and the CBD. The inflammatory involvement results in scar-tissue formation in the pancreatico-duodenal groove and subsequent cystic dystrophy of heterotopic pancreatic tissue in the duodenal wall.6,16 Imaging features include inflammatory involvement of the pancreas and medial wall of the duodenum,with cystic changes limited mostly to the pancreatico-duodenal groove (Figure 10). Groove pancreatitis can occasionally mimic pancreatic adenocarcinoma given its focal nature, its propensity to cause strictures of the bile and pancreatic ducts, and its fibrotic character, which leads to decreased enhancement and T1 hypointensity. Findings favoring groove pancreatitis over adenocarcinoma include cystic changes within the lesion, smooth rather than abrupt narrowing of the pancreatic and CBD, and a sheet-like mass rather than a rounded mass. 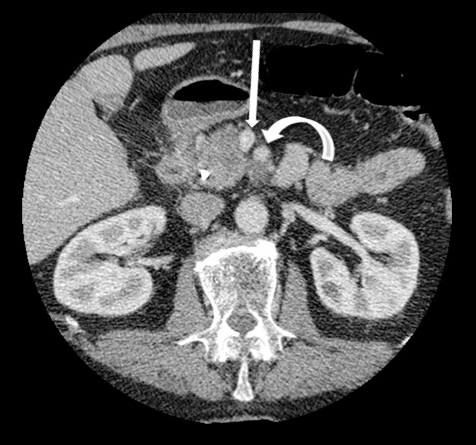 Autoimmune pancreatitis has typical imaging features. 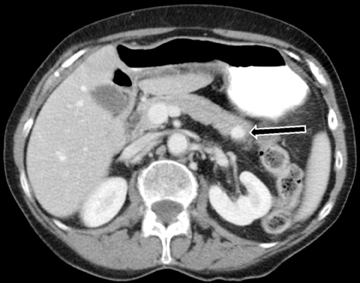 Classically it is described as diffuse pancreatic enlargement, which becomes featureless secondary to loss of normal pancreatic lobulations, foreshortening of the pancreatic tail and a peripheral rind or ‘wrapping’ around the pancreas, which appears hypodense on CT and as hypointense on both T1 and T2 images (Figure 13). Pancreatic ductal irregularities are often seen as ductal strictures or diffuse narrowing.20 Autoimmune pancreatitis can also present as a focal mass, which often poses a diagnostic dilemma (Figure 14). The differences and similarities in imaging features of focal autoimmune pancreatitis and pancreatic adenocarcinoma are listed in Table 4. 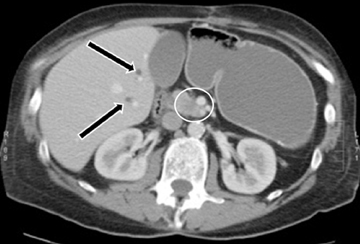 Increased utilization of cross-sectional imaging, such as MDCT and MR, has led to an increased detection of cystic pancreatic lesions with nearly a third of cases being diagnosed in asymptomatic patients (Tables 5 and 6) and a prevalence of incidental cystic lesions on CT being present in 2.6% of examinations.22 Despite the significant overlap in the imaging features of pancreatic cystic lesions, MDCT andMRI are fairly accurate in the characterization of these lesions. Occasionally, EUS with or without aspiration/biopsy might be necessitated for characterization prior to surgical intervention. 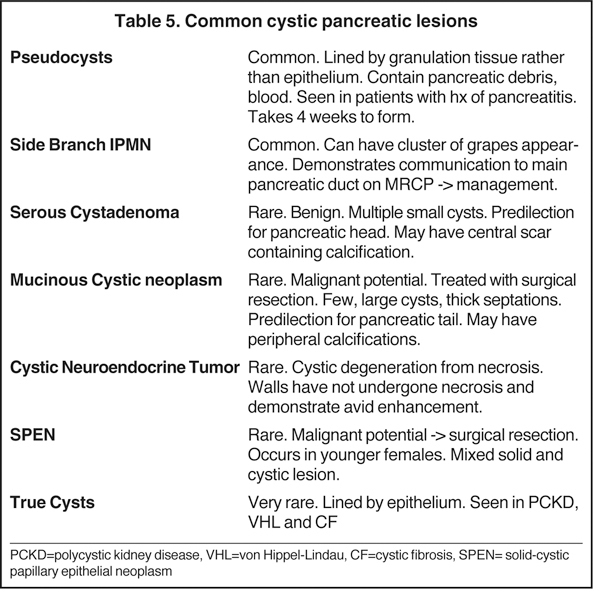 IPMNs are commonly encountered cystic lesions of the pancreas and can be classified based on involvement of the main duct and side branch. There is the main duct IPMN, side branch IPMN, and combined IPMN (involving both main duct and side branch). Main duct IPMNs cause diffuse enlargement of the pancreatic duct and do not present as cystic lesions of pancreas. Up to 40% of main ducts IPMNs have malignant features at diagnosis and they are often surgically resected. The features on imaging suggestive of malignancy in main duct IPMNs include enhancing mural nodules or main duct dilatation > 1 cm. On the other hand, side branch IPMNs (also known as branch duct IPMNs) are less likely to be malignant and are often followed up on serial imaging. 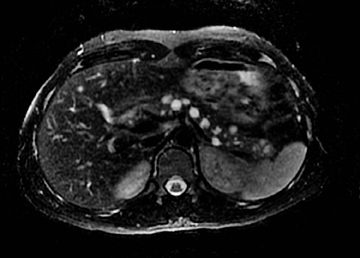 Side branch IPMNs have a macrolobulated or ‘cluster of grapes’ appearance on imaging. The most characteristic imaging feature is the communication of the lesion with the main pancreatic duct, which differentiates them from mucinous cystic neoplasms. A typical finding on ERCP is the so called ‘bulging papilla’ secondary to increased mucin production by the lesions. Demonstration of communication with the pancreatic duct with MRCP or ERCP is of paramount importance in diagnosing IPMNs as this limits the differential diagnosis of a cystic lesion to IPMN and pseudocysts, which are the only other cystic lesions to demonstrate ductal communication. 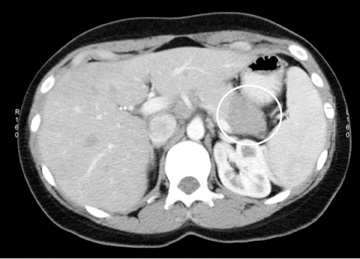 Surgical resection is performed in symptomatic patients or in those lesions that demonstrate suspicious features on follow up imaging, such as enhancing mural modules, a size > 3cm and concomitant main pancreatic ductal dilatation.2,23 In asymptomatic patients with side branch IPMNs measuring < 3 cm without solid nodules, follow-up imaging is recommended for detection of suspicious features. Neuroendocrine tumors, as discussed below, can sometimes undergo cystic degeneration and mimic a cystic neoplasm. The outer wall of the lesion will often be spared from cystic degeneration and therefore demonstrate features consistent with neuroendocrine tumor, specifically avid early enhancement (Figure 17). Unlike cystic lesions seen in other solid organs in the abdomen, true cysts are rare and almost never occur in a normal patient population. When present, true cysts are often multiple rounded and well defined lesions. 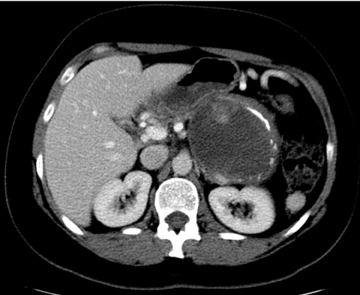 Evidence of underlying conditions, such as von Hippel-Lindau disease, polycystic kidney disease, and cystic fibrosis, are often apparent on imaging (Figure 20). 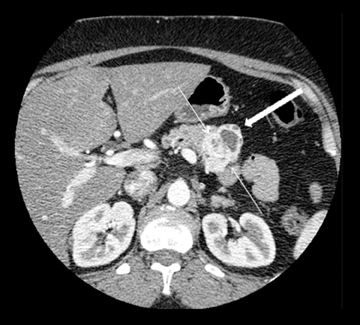 Multiphasic MDCT of the pancreas is the modality of choice for diagnosis and staging of pancreatic carcinoma and involves acquisition of images in the pancreatic phase instead of the arterial phase. MDCT has a dual role in pancreatic cancer which includes lesion detection, localization and characterization; and secondly, in the determination of tumor resectability. 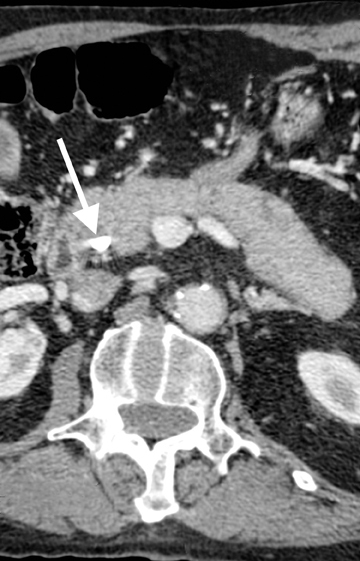 Although ultrasound and MRI may playa role in the initial diagnosis of pancreatic carcinoma, MDCT is preferred for diagnosis and staging. On US, they are seen as ill-defined hypoechoic lesions within the pancreas. On T1-weighted MRI, the mass will be hypointense to normal the pancreas. 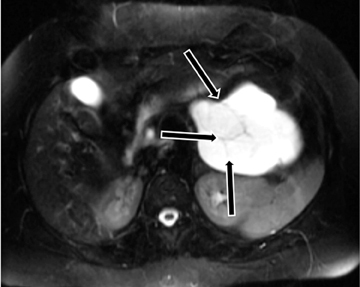 On both MDCT andMR, pancreatic cancer appears as a hypoenhancing mass with focal contour abnormality. The hypoenhancement is accounted for by the desmoplastic and hypovascular nature of the tumor. On dynamic images, the pancreatic phase shows the greatest attenuation differentiation and is therefore more sensitive than the portal-venous phase in detection of these lesions. However, in up to 10% of cases, pancreatic cancer can be iso-attenuating to pancreatic parenchyma, and therefore secondary signs provide a clue to diagnosis. 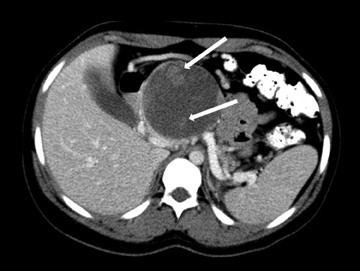 These secondary signs include pancreatic ductal dilatation and parenchymal atrophy distal to the lesion with abrupt change in ductal caliber at the site of lesion (Figure 21).While MDCT is about 95% accurate in diagnosing pancreatic cancer, approximately 5% of patients undergo surgical resection for benign disease, such as chronic pancreatitis or focal AIP. On T2W MR imaging, the lesion itself will often be inconspicuous, but secondary signs of upstream pancreatic ductal dilatation or focal contour abnormality of the pancreas may be seen. 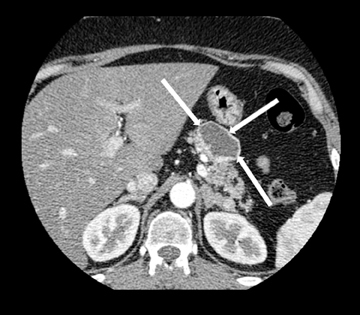 There are tumors which are considered by CT criteria to be borderline resectable. Findings on CT consistent with borderline resectability include tumors that about < 180 degrees of the circumference of SMA or celiac artery (Figure 22). With short segment encasement of the common hepatic artery surgeons can often perform resection with grafting, a technically feasible, and oncologic sound technique. While clearly enlarged and distant lymph nodes are consistent with nonresectable tumors, imaging alone is inaccurate in assessment of lymph nodal involvement with metastases. Additionally, positive lymph nodes within the resection bed may be removed at the time of surgery leaving the patient with no residual disease. Using these parameters, CT is about 95% accurate in precluding truly unresectable patients from undergoing an unnecessary attempted Whipple’s procedure. However, only about 50% of cases thought to be resectable at CT are truly resectable at the time of laparotomy. 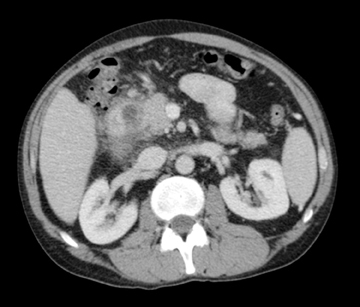 In cases in which the pancreatic cancer is determined either by CT or laparotomy to be borderline but unresectable, attempts made to convert the patient to a surgical candidate by giving neoadjuvant chemotherapy and/or external beam radiation therapy and then restaging. Also referred to as pancreatic islet cell tumors, these arise from pancreatic ductal cells and despite resemblance to normal islet cells histologically, they are appropriately termed as pancreatic endocrine tumors. 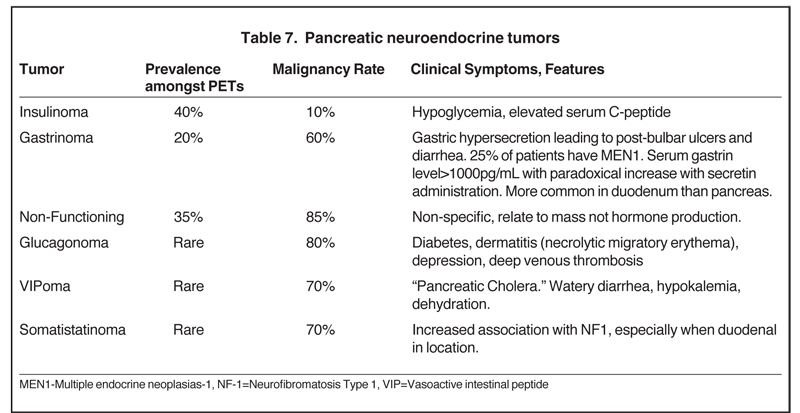 There are 7 different types of pancreatic endocrine tumors, the most common of which are insulinomas, gastrinomas, and nonfunctional tumors (Table 7). Pancreatic endocrine tumors account for only 1% to 2% of all pancreatic neoplasms and affect only 1 in 100,000 persons. The typical age of onset is in the fourth or fifth decade.Most of these pancreatic endocrine tumors occur sporadically; however, certain syndromes, such as an MEN1, Von Hippel-Lindau,neurofibromatosis, and tuberous sclerosis, increase the likelihood of developing these tumors at a younger age. Pancreatic endocrine tumors are considered malignant based on biologic behavior (extra-pancreatic invasion or metastatic disease), not pathologic findings. The so-called functioning pancreatic endocrine tumors often produce characteristic clinical symptoms depending on the hormone excreted. Pancreatic endocrine tumors are highly vascular lesions leading to the characteristic finding of early and avid contrast enhancement. The homogeneous enhancement is the rule for smaller lesions, while larger lesions may show areas of necrosis and cystic degeneration and have heterogeneous or only peripheral enhancement (Figures 23 and 24). Unlike pancreatic adenocarcinomas, pancreatic endocrine tumors are more conspicuous on the early arterial phase and stand out as hyperattenuating compared to the normal pancreas. Most tumors appear well circumscribed, but larger and malignant tumors may demonstrate poorly defined borders. Nonfunctioning pancreatic endocrine tumors, either because of their inherently aggressive behavior or delay in presentation, are seen with metastasis in about 70% of cases. On MRI, these tumors are T1 hypointense and characteristically, but variably, T2 hyperintense. Indium-111 octreotide scans can be used and are most helpful in identifying subtle foci of metastatic disease in patients whose tumor is known from pathologic examination tobe well differentiated and contain somatostatin receptors. Pancreatic endocrine tumors may sometimes be peripancreatic, such as duodenal, in location.30 The overall sensitivity of Indium-111 octreotide scintigraphy for diagnosis of pancreatic neuroendocrine tumors is high with 80% to 100% sensitivity for carcinoids and 60% to 90% for pancreatic NETs. 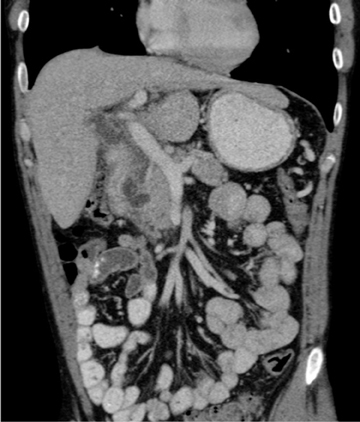 Optimization of scanning protocols as well as knowledge of the various maladies of the pancreas and the role of imaging in the clinical management of patients with pancreatic disorders allows the radiologist to play a large role in the diagnosis and management of inflammatory as well as neoplastic disorders of the pancreas. Blasbalg R, Baroni RH, Costa DN, Marchado MC. MRI features of groove pancreatitis. AJR Am J Roentgenol. 2007;789:73-80. Pezzilli R, Imbrogno A, Fabbri D. Autoimmune pancreatitis management: reflections on the past decade and the decade to come. Expert Rev Clin Immunol. 2012; 8:115-117. Psarras K, Baltatzis ME, Pavlidis ET, et al. Autoimmune pancreatitis versus pancreatic cancer: A comprehensive review with emphasis on differential diagnosis. 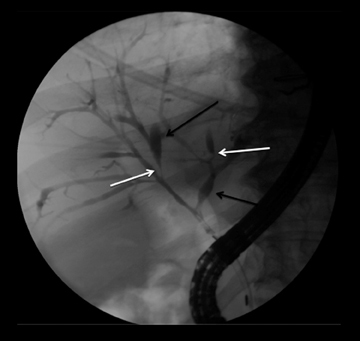 Hepatobiliary Pancreat Dis Int. 2011;10:465-473. Okazaki K, Kawa S, Kamisawa T, et al. Clinical diagnostic criteria of autoimmune pancreatitis. J Gastroenterol. 2006;41:626-631. Kawamoto S, Siegelman SS, Hrubran RH, Fishman EK. 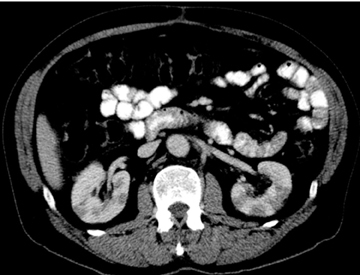 Lymphoplasmacytic sclerosing pancreatitis (Autoimmune Pancreatitis): Evaluation with multidetector CT. Radiographics. 2008;28:157-170. Lee F, Raleigh J. Tropical calcific pancreatitis. N Engl J Med. 2011; 13;365:1425. Laffan TA, Horton KM, Klein AP, et al. Prevalence of unsuspected pancreatic cysts on MDCT. AJR Am J Roentgenol. 2008;191:802-807. Augustin VT, Vandermeer TJ. Intraductal papillary mucinous neoplasm: A clinicopathologic review. Surg Clin North Am. 2010;90:377-398. Sahani DV, Kadavigere R, SaokarA, et al. 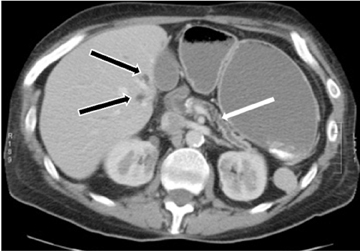 Cystic pancreatic lesions: A simple imaging-based classification system for guiding management. Radiographics. 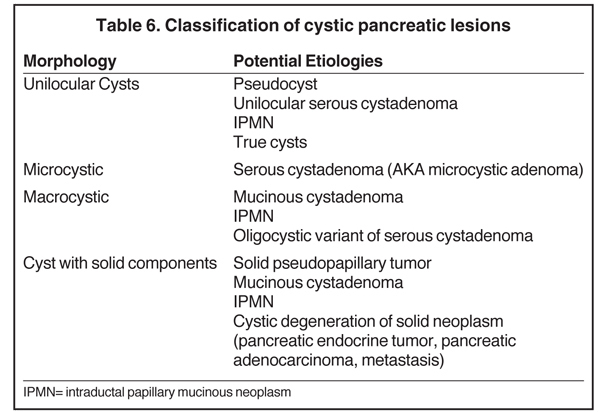 2005;25:14711484.
de Jong K, Bruno MJ, Fockens P. Epidemiology, diagnosis, and management of cystic lesions of the pancreas. Gastroenterol Res Pract. 2012;147465. Epub 2011. Igbinosa O. Pseudopapillary tumor of the pancreas. An algorithmic approach. JOP. 2011;12: 262-265. Saif MW. Pancreatic neoplasm in 2011: An update. JOP. 2011;12:316-321. Bachellier P, Rosso E, Lucescu I, et al. Is the need for an arterial resection a contraindication to pancreatic resection for locally advanced pancreatic adenocarcinoma? A case-matched controlled study. J Surg Oncol. 2011;103:75-84. Oberg K, Eriksson B. Endocrine tumours of the pancreas. Best Pract Res Clin Gastroenterol. 2005;19:753-781. Lewis R, Lattin GE, Paal E. Pancreatic endocrine tumors: Radiologic-clinicopathologic correlation. Radiographics. 2010;30:1445-1464. Imaging of the pancreas: Part 2. Appl Radiol.